From this Friday and every Friday after, SnitchSeeker will post reviews of some new, nifty, or mind-blowing Harry Potter merchandise available at the Warner Bros Shop. The inaugural item will be the rather-heavy Ravenclaw House-styled pen (don't worry, there are Gryffindor, Hufflepuff, and Slytherin pens too). 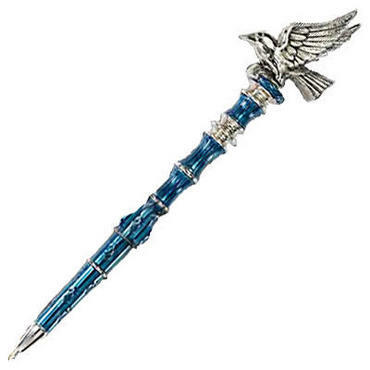 The initial allure of the Ravenclaw pen is of course its design - it stuck out against pens from the other three houses, personally because of its multi-ringed layers. The pen is easy to grip and write with, though those with weak hands do heed with caution, as the pen is much heavier than the average pen or pencil. This is obvious due to its metallic body and avian head - raven, and sadly not an eagle as it is in the books. Nonetheless, the pen writes beautifully, and in black ink - though one would imagine that once the ink runs out the ink tube can be changed to whatever color you please: blue naturally comes to mind. One thing that was of some surprise was that the silver and blue design color scene/design on the metal frame of the pen wasn't as glossy or shiny as one would hope it would be, but looks a bit antiquated. Perhaps that was the idea, to make it look like it had survived centuries of brainy Ravenclaws using them up constantly in their common room and dorms at Hogwarts. One small quibble to be had of the pen - as any die-hard Harry Potter book-reading fan knows, the Ravenclaw House colors are blue and bronze, though in the film series they are shown as blue and silver (for whatever reason that has yet to be explained by the producers or crew). This pen of course mirrors the colors featured throughout the movies, which does make some sense as they're being sold at Warner Bros' shop! Had it been Scholastic or Bloomsbury who sold the pen in such a color scheme, and then there would be some seriously harsh words about not keeping to the books. The pen seems more of a keepsake, and one for those who hold their Hogwarts Houses close at heart - good thing all four House-themed pens are available. The new generation of Harry Potter fans who felt they were sorted into their official Houses via Pottermore, as JK Rowling herself wrote the Sorting Quiz, may also enjoy the pen to have as a badge of House pride and honor. And yes, every once in a while, to write with, too. Head to the Warner Bros. Shop to order the Ravenclaw pen or check out the pens of the other three Hogwarts Houses - oh, and yes, we WILL be giving them away to our readers next week! The Warner Bros Shop also released four new watches, featuring Harry, Hermione, the Deathly Hallows logo, and Hogwarts crest, on their site for fans to purchase. More on that can found here. All of the different houses' pens look beautiful!